#AskExcelinEd: What Are CTE Program Quality Indicators? ExcelinEd’s new Career and Technical Education playbook series offers specific, sequential steps to help states improve their CTE programs. Today, the series’ co-author, Dr. Danielle Mezera, shares how states can jump start CTE programs in the new era of Perkins V.
Getting to the heart of what comprises a high-quality state CTE program that fully reflects state priorities begins with the auditing of the current state CTE program. Though the audit process can be intensive, the results will provide states with clear roadmaps that will lead to the development and execution of meaningful, actionable Perkins V state plans. 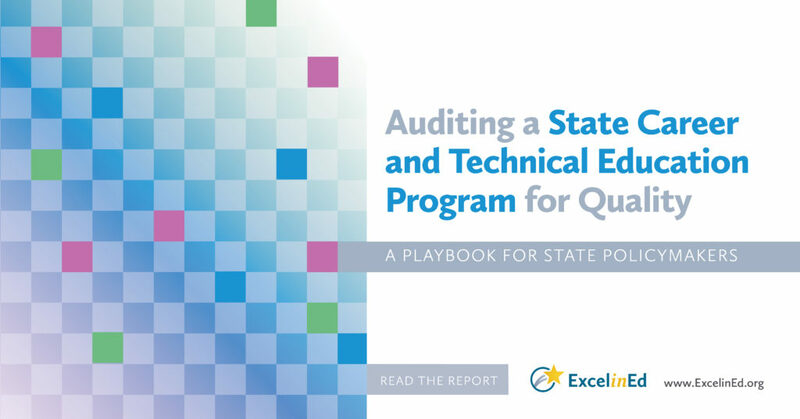 ExcelinEd’s newest CTE playbook, Auditing a State Career and Technical Education Program for Quality, offers state policymakers a guide through this important process. Last week, we discussed the three main phases CTE program audit should encompass. These phases include: planning and prep, implementation and analysis. View ExcelinEd’s state CTE program audit template for program quality indicators. The audit’s program quality indicators (PQIs) should reflect what constitutes a high-quality state CTE program. These PQIs also serve as quality thresholds or benchmarks once data are collected and measured against the audit’s established priorities. By evaluating program outcomes against these PQIs, a state policymaker can better understand whether their CTE program meets a high bar for quality, or, if not, where their program has fallen short based on the established priorities and thresholds. To start the work, ExcelinEd has distilled the following six state CTE program quality indicators for consideration. These may serve as a starting point for states as they determine their own PQIs and definitions based on their identified priorities. “College and Career Ready” Programs of Study: CTE programs of study should incorporate a series of progressive industry-relevant and industry-valued courses that are sequential and that purposely braid core academic and technical skills learning. Course standards should reflect an elevated level of instructional rigor that matches the desired level of learning. Where appropriate, completed coursework should lead to awarded postsecondary credit and industry-valued certifications. Education and Industry/Labor Alignment: CTE programs of study should fully align with statewide, regional, and local (where appropriate) economic and workforce priorities and projected growth areas. Data should call attention to the role secondary education must play in meeting those opportunities. Postsecondary and Secondary Program Systems Alignment: CTE programs of study at the secondary level should be vertically aligned with credentialed programs offered at the postsecondary level. These alignments in turn should be fully aligned with the state’s economic and workforce priorities. This vertical sequencing ensures that there are “no dead end” programs. Career Transition Experiences and Skills Development: The state CTE program should promote and provide multiple access points for students to obtain employability- and career-related experiences. These should be visibly progressive over the course of a student’s learning continuum, culminating with one or more capstone experiences that allow a student to exhibit her/his academic and technical skills development. Educator “Lifecycle” Professional Development: The state promoted CTE educator professional development and training program should be complementary to the rigor and relevance of the state promoted CTE programs of study. It should reflect and reinforce the necessary classroom conditions and instructional capacities needed to achieve student academic and technical learning success. Utilizing the “lifecycle” approach, educators are provided multiple, ongoing touch points over the course of a given year and over the course of their profession to sharpen their instruction and retain relevant industry know-how and skills. Leveraged Funding to Drive Policy and Program: Targeted federal, state and local funding are identified and leveraged through state policies to drive attainment of state CTE program priorities. Measurable PQIs that align to a state’s values are a vital part of a state CTE program audit because they ensure the state is on the right path toward meaningful results for its students and communities. However, they are just one part of the state CTE program audit process. I encourage you to look at ExcelinEd’s CTE playbook series, including accompanying resources and templates, for comprehensive playbooks of specific, sequential steps for consideration to help your state improve your CTE programs. In March 2017, Danielle Mezera launched her boutique consulting firm, DCM Consulting, specializing in K-12 and postsecondary education and the intersection of these to inform strong education-to-career learning pathways. Prior to this, Mezera served as the Assistant Commissioner for College, Career and Technical Education for the Tennessee Department of Education. As Assistant Commissioner, Mezera oversaw CTE curricula, state-promoted early postsecondary course offerings, ACT/SAT, postsecondary matriculation initiatives, K-12 school counseling and work-based learning. She also served as state lead with Pathways to Prosperity Network and the J.P. Morgan Chase - New Skills for Youth grants. Prior to assuming her state role, Mezera served as chief education policy advisor for Mayor Purcell and Mayor Dean of Nashville-Davidson County. Before entering public service, Mezera served as a director at the Vanderbilt University Institute for Public Policy Studies. During her tenure at Vanderbilt University, Danielle held various senior level positions in administration. Mezera holds a B.A., M.Ed. and Ph.D. in education.